It may fit in an Altoids Tin, but what purpose would it serve? For personal protection, well, after you take the requisite 5 minutes to extract and deploy it, the threat will already be gone (or you dead). Most likely you'd end up shooting yourself with it though, due to it's awkwardness and quite unsafe-looking profile. For sustenance hunting, you'd probably do better with a slingshot. That toy is not going to be accurate at all. One: because of it's overall design, Two: because it doesn't even have any sights! You would be lucky to hit a dinner plate with it from two feet out. Where are the rails for mounting telescopic sights? Do you call "King's X" when you must reload? I'm not a big fan of .22 LR for defensive purposes, and I'm rather less of a fan of very small pistols for taking small game. I like the idea of .22 LR takedown rifles for survival hunting a lot more. I see no use for this in taking game, and very little in self defense. It is a gimmick and nothing more, unless it is intended for illegal activities. I hear you on that. I have used an AR-7 for many years, mostly plinking, but if were to get hungry, it would do the job. The newer versions can accept telescopic sights,etc. quite readily. It needs a laser and a magazine. And a 16" barrel. Guns like that have been around for about a century. They were designed for spies, assasins or resistance fighters. The Liberator pistol kind of falls in that category too. They were intended for close range use. Precission or fast deployment were not really required for that. It may be a collector´s item just like that Swiss revolver in caliber 2.34 mm. 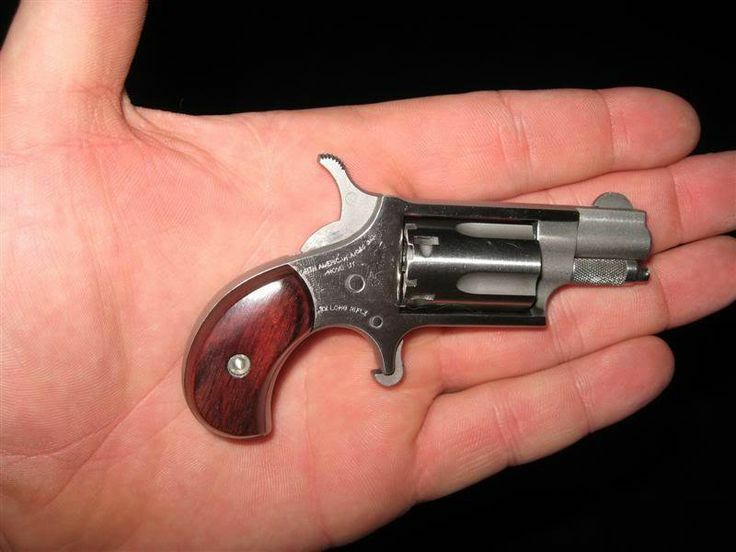 I would not mind having a gun this small and in .22lr. However, I would prefer it to have a trigger guard and be non-folding. I am sure there is something out there like what I described. I have just not had the motivation to search. The smallest I know of is the NAA mini revolver. Comes in .22LR and also in .22Mag. I've shot both, didn't hit much with either one. They hold 5 shots. Seemed well enough made, and interesting to shoot just so I could say that I did. At the distance you could hit something with one of these, you could also stab it, and a knife would be more effective IMHO. But if you want small ... this is it. Generated in 0.038 seconds in which 0.012 seconds were spent on a total of 14 queries. Zlib compression enabled.